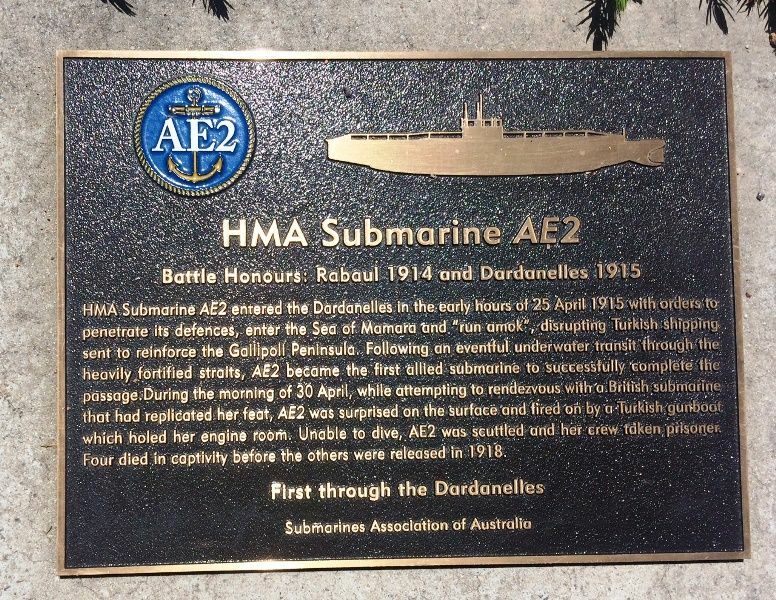 The plaque commemorates the contributions of Australian submarine AE2 in World War One. Australia's first submarines, the AE1 and the AE2, were launched in 1913 and were manned by composite Australian and British crews. At the outbreak of the World War One, the two submarines were sent from Sydney to German New Guinea with the Australian Naval and Military Expeditionary Force and helped to capture the German colony. The AE2, commanded by Lieutenant Commander H. S. Stoker, achieved fame for its operations in the Dardanelles. The AE2 was ordered to sail through the Dardanelles and disrupt Turkish shipping in the Sea of Marmora. No other submarine had yet managed to breach the Turkish defences but, in the early hours of 25 April 1915, the AE2 got past minefields and land-based guns. After torpedoing a Turkish destroyer it reached the Sea of Marmora. The AE2 remained at large for five more days before sustaining irreparable damage while under heavy fire. Stoker was forced to sink the submarine and surrender. He and his crew spent the rest of the war in Turkish captivity. Stoker was awarded the Distinguished Service Order after the war. The wreck of the AE2 was located in June 1998. HMA Submarine AE2 entered the Dardenelles in the early hours of 25 April 1915 with orders to penetrate its defences, enter the Sea of Marmara and "run amok", disrupting the Turkish shipping sent to reinforce the Gallipoli Peninsula. Following an eventful underwater transit through the heavily fortified straits, AE2 became the first allied submarine to successfully complete the passage. During the morning of 30 April, while attempting to rendezvous with a British submarine that had replicated her feet, AE2 was surprised on the surface and fired on by a Turkish gunboat which holed her engine room. Unable to dive, AE2 was scuttled and her crew taken prisoner. Four died in captivity before the others were released in 1919.